Under The Bridge - Lake Houston Fishing! Pictures were taken on Wednesday, 01 January. Water temp was 48 degrees, ambient temp was 42 degrees. Water color was clear, but the level was down about 2 feet. 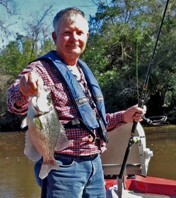 Caught 3 Crappie under the bridge and 5 in the channel near the marker south of the bridge. The wind was light out of the North, but the current was pretty swift going to the lake. That bridge can be pretty photogenic when the water is calm and there's no boat traffic!! going south from the ramp trying to get by the boats . nice catch.